Sun Valley’s River Run gondola. - Fishing in the Big Wood River. - The Valleys elaborate hiking and biking trail systems. - Walking distance to town. Pennay’s at River Run is not a hotel; our 18 properties include one and two bedroom condominium suites with a range of floor plans that will accommodate up to seven people. All located in a beautiful residential park like setting. Relax and take in the mountain views from our large outdoor jacuzzi, and our decks and balconies off each unit. Enjoy a spacious and comfortable residence featuring a full kitchen including a stovetop, oven, refrigerator, and microwave. Beautifully designed living and dining areas, gas fireplaces, complimentary wireless internet and quiet bedrooms with flat panel TV’s in each room. 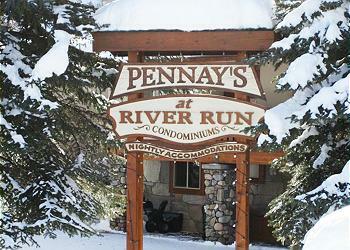 An exceptional value and an ideal location, Pennays is the perfect place to make your mountain retreat. Picking the perfect location for your stay in Sun Valley is very important. Leave your car keys in your room and make your stay a memorable experience. Pennay's at River Run is simply the best location in town. We are nestled at the base of Mount Baldy on the Big Wood River in famous Sun Valley with ski-in ski-out access, only 200 yards from the River Run Lodge & Gondola. We will even pick you up after a fantastic day of skiing in our sleigh! During the summer months you can hike, bike and fish from you back door. Enjoy a 4 minute walk to downtown Ketchum where you will find elaborate art galleries, shopping and a host of dining amenities. With our on-site managment, our hospitality is unbeatable. We will take great pleasure in hosting your visit to Sun Valley!